When Valerie plays violin at home, her cat pays rapt attention while sitting in her violin case. More on cats later. Valerie grew up very interested in art, but not really in music. Then, when she was in elementary school, her family moved from her native Oahu, Hawaii, about as far away as you could go and still be in the US—all the way to Rhode Island where her father went to grad school. “I couldn’t find art lessons, but I did find a weekend strings program and figured, ‘why not?’” Her school system didn’t have a good music program, so Valerie played in weekend programs (with weekend lessons) through high school, joining the Young People’s Symphony of Rhode Island and the Rhode Island Philharmonic Youth Orchestra. College saw her coming back west to Stanford University, majoring in chemical engineering and playing in the Stanford Symphony Orchestra during her freshman and sophomore years. But then, yes, she dropped violin for 5-6 years while she concentrated on academics. 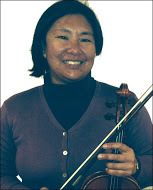 It wasn’t until halfway through grad school that she played again—in the UC Berkeley Summer Orchestra. She now holds a PhD in chemical engineering from UC Berkeley (whomever does she root for in the Big Game?!). The allure of the West eventually called Valerie back to California (or it might have been that job at Genentech) where’s she now settled, having recently switched to a job at Bayer Healthcare Pharmaceuticals in Berkeley (the nerve center of the company’s global biotechnology manufacturing operations no less). When she arrived, Valerie looked around for highly regarded community orchestras and found Prometheus through friends in a chamber workshop (she also joined nearby Holy Names University Orchestra and she admits that Redwood Symphony was on her list, but it’s too far away from her home in Vallejo, so lucky us!). She became our principal second in no small part due to her steady hand and indomitable beat. Back to the cat. Yes, it’s clear now —Valerie knows how to herd cats, and the second violins are all the better for it!